Which is your favorite from March-April? You post anything you want here - art, stories, videos, music - and people in the discussion thread will give you more immediate feedback. No waiting for judges! I'll personally be keeping an eye on it to read over anything you submit and I'll also comment on it - how you can improve, what the weak spots are, the parts I like about it best, and so on. Feedback will be guaranteed and much more rapid - and comprehensive, as you'll be able to ask me (and anyone else) further questions, and we can work with you to help you improve if you'd like. This is something that people often had a problem with during the previous contests - nobody knew how to contact the judges. The rules are very, very simple. There won't be any prizes - this time it's purely about creating things, having people look at them, and getting feedback. Anything you post must be your own work. Don't post pictures you found on Google Images or somewhere else. I will know. You are allowed, however, to use textures from other places, or stock images as part of whatever you post, same as before. It must be related to the topic. This month's topic: Weapons - as suggested by HowSerendipitous. You are allowed to post as many things as you want. No limits or restrictions! If you create it, you can post it! All submissions must be made before the end ofJune. And that's it! At the end of June, I'll close this topic and open a new one, with a different theme. We can keep going from there. Eventually, as we get closer to Beta, I'm sure interest in an actual fan contest will pick up again. At that point, I'll re-start the old contests as before. During the intervening time, all the contests that myself and the other judges have fallen behind on, will be judged. Until then, I'll put up a poll where people can vote on their favorite works of the previous creation threads (starting in July), and the winner will receive a prize of some sort - just for fun. Probably in the form of a $30 voucher. At the end of thirty days of voting, I'll offer a $30 Steam/GOG voucher to the winner of the March-April LTFC. Most importantly, of course, have fun! As usual, for those with a bigger screen, a version with a bit more pixels is available here. Obviously the first image is a marginally modified screenshot from LT (thanks to Corn for the screenshot); the ship has been modelled from a submachine gun picture found somewhere on the web and textured to appear bigger. Sorry for the limited effort, but real life is quite crazy these weeks. Final Stage Maneuvering makes no warranty of safety, express or implied. Consult your relife insurer prior to use. Surgeon general's warning: The use of nucleonic and fundamental weapons may severely reduce your shell's operating lifetime. The Final Stage Maneuvering gluegun brings ultimate destruction to its target. It bypasses class D shielding entirely and tears through class A and B. (For targets fitted with class C or E shielding, consider the Final Stage Maneuvering chromatic inverter.) 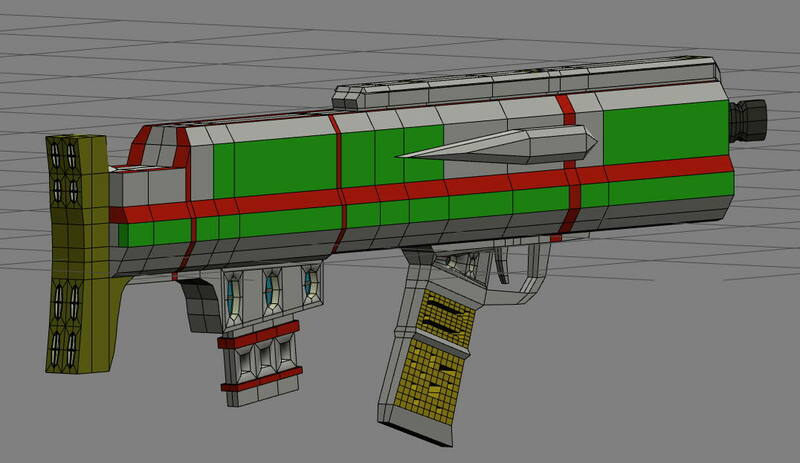 As with many tier eight weapons, the gluegun requires both powerful reactors and intimate knowledge of the battlefield. "What are you on about? Your ship doesn't even have rockcutters fitted, let alone weapons!" 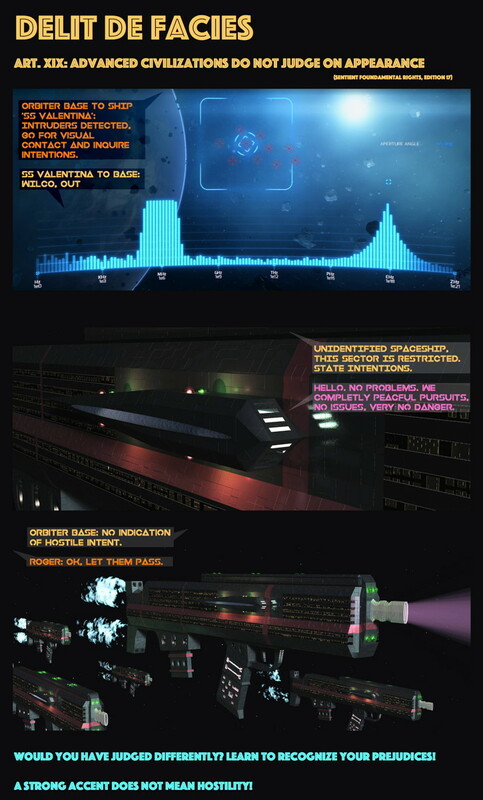 "Computer, I want material readings on that vessel's hull." "Strong titanium lines; notable aluminum and vanadium. Several other elements detected; full results saved to log." "No weapons, you say? Want me to keep making readings until I can see oxygen, or do you want to show me some helium instead?" "Come along son, this is the best part!" Felix said, beckoning to his companion. Erik looked up at his father, his eyes passing over a brightly lit sign behind him; 'Post terrestrial warfare' it proclaimed in bold letters. In the brightly lit gallery further down the corridor, Erik could see several small spacecraft dangling from the ceiling on gossamer wires and on the ground were various cabinets and stands containing weapons and models. They had been wandering around the New Amsterdam Imperial Museum for most of the day now. They had already heard an announcement warning them of the museums impending closure, but Felix merely smiled and told Erik not to worry. "I know the curator" he said enigmatically. Coming to the first exhibit, Felix burst into laughter. "Why are you laughing, father?" Erik asked, staring at the object of Felix's mirth, a large white missile with NASA scrawled on the side in red letters. There was a checkerboard pattern wrapped around the upper end of the missile and the tip was painted black. There was a plate in front of the missile, but Erik couldn't see past a couple who were reading it. "Son, this weapon is over a thousand years old!" Felix replied "It was built in.... Hum, 2020 something, after some idiot politician decided that the treaties preventing the militarisation of space didn't apply to him. 1,500 years old, almost! Can you believe it?" "Wow!" Erik exclaimed, reaching over to try and touch the metal casing. Felix shook his head and continued his explanation "Not only that, it's an old nuclear warhead, fusion I'd guess without a glance at that plate. One of these is enough to destroy this entire museum and half the city.... But compared to modern weaponry, it's nothing. A mere pinprick. But this was ancients’ ultimate weapon." "What is NASA?" Erik asked his father, still staring at the missile, but putting his arm down by his side. "Not a what, son, but a who." Felix replied "NASA was an organisation, they were some of the pioneers; along with a group called the Soviets, they were the first people to go into space. By the time this missile was built, we'd gone to Earth's moon and had built several space stations. It was nothing like the monsters we have now; it was a spindly little thing that would hold less than 10 people." Erik stared at the missile in wonder "But father, this is an amazing piece of history, yet you laughed?" "Son," Felix replied, the smile evaporating from his face "This weapon sums up human nature. I said the space station was a spindly little thing? This missile would destroy it in a heartbeat. It's too much, it's simply overkill. Kind of like using a sledgehammer to crack a nut." Felix beckoned to Erik and they moved onto the next exhibit, Erik taking his father's hand with a smile. Walking towards a black, almost bat-like fighter that was hanging from the ceiling, Felix suddenly veered to the left, pulling Erik towards a model of a gun turret. There was a single ribbed barrel, with a glassy lens at the end. Cooling fins extended from the back of the turret like wings. "Ah, now this is a classic." Felix said, gesturing to the weapon. "It's not the genuine article, it would be much bigger... But this is late model laser cannon." "Lay-zer?" Erik said, rolling the letters around in his mouth. "Yup, a laser." His father replied "After nuclear missiles this was the next big thing. The ancients spent years and vast sums of money on these colossal wastes of time. Ultimately, they found that they simply couldn't get enough destruction out of a laser to warrant the hassle; the lenses were vulnerable to micro meteors, they were easily reflected, useless in a nebula.... In the end they just went back to missiles." Erik pointed upwards "What's that, father? It looks like a space fighter!" Grinning, Felix nodded. "That's right son. That's a A-1B Stormbringer! Mark 4, I believe... Look at the engines. Amazingly, that was the first viable aerospace fighter ever built, an aircraft that could fight equally well in space or within an atmosphere. There were a group of bad people that were extremely surprised when these came screaming in from orbit.... They surrendered without a shot being fired." There was another announcement over the museum address system, an obviously artificial voice declaring that there were five minutes until the museum closed. Erik looked up at his father anxiously, but again he said he knew the curator and pulled him further into the exhibits. Meanwhile, other museum patrons were filing towards the exit. Letting go of his father's hand, Erik scuttled over to a model in a large glass case. It was a warship, bristling with weapons and a group of tiny landmarks next to it, with a sign saying 1:200th scale. His father followed him, nodding approvingly. Cheerfully he said "Ah, I see you've found the....." He paused as another voice intruded. "Well, well, well..." A booming voice echoed around the gallery "If it isn't my old friend, Lieutenant Strauss!" Turning towards the new arrival, Felix saluted. The man saluted back as he ambled down the gallery. He was tall and stockily built, wearing a dark suit with a small name badge on his chest. Erik merely stared at his father in wonderment. "Erik, this is an old friend of mine, James." said Felix. Erik waved shyly at him. "Good to see you Felix!" James said, peering down at Erik while shaking Felix's hand "Is this your boy? Good to meet you son. Your father here was the finest navigator in the service. There was no-one better if you needed to steer a spacecraft." As the two old friends started to get engrossed in a conversation, Erik crept away from the two men, looking around at various pieces of military hardware. Plasma cannons, particle cannons, a model of a Nova Bomb. He saw several types of aerospace fighter and pieces of powered armour. Eventually, he went full circle, and on the way back to his father he found himself going back to the model spacecraft near to where the two adults were still talking. Looking at the ship in awe, he moved over to the large plate next to it, detailing what adventures in which the crew had gotten themselves embroiled and started to read. "This cabinet contains a model of the IWS Gladiator, a Mercury class light cruiser and the lead ship of the 4th Light Cruiser Squadron of Battlegroup Elysium. Captained by Amelia Webb, the Gladiator was destroyed in battle in 3351, her crew being posthumously awarded the Imperial Gallantry Medal. During the Battle of Kavir, Captain Webb chose to stay behind and defend the planets domed cities from bombardment while the rest of the fleet went to reinforce the battle line at Columbia. Eventually the Gladiator's shields were overwhelmed and she was destroyed while blocking the last bombardment torpedo from impacting the surface. While Captain Webb's actions were seen as suicidally brave in some circles, her and her crew saved the lives of 16 million Imperial citizens." Amazed by what he had read, Erik walked back to his father and James, who were finishing up their conversation. "Take care, and make sure to give me a call. It'd be good to catch up!" Felix said, as James turned to go. Turning to Erik, he smiled and said "Are you ready to go, son? Unfortunately they're cleaning tonight so we can't stick around. But we will be back." Erik nodded and said "I didn't realise you were a pilot, father." "It was a long time ago, son." Felix replied "But it was a career, I made a lot of friends. And, you know, I feel like I did some good in the universe. It certainly wasn't easy, but I felt at home there. Then I met your mother and you came along... The fleet didn't seem so important then." Erik nodded again, then he slowly said "When I grow up, I want to be a pilot too. I want to be the greatest pilot and be brave like the crew of the Gladiator!" Felix smiled down at Erik "Well then," he said "Let's go and talk about it over a burger! I’m sure I have a few stories I can tell you…"
With that, they both scurried out of the museum, before security dragged them out. The buzz of an alarm dragged Commander Erik Strauss from his musing: He had ten minutes to get to the lecture hall and attempt to turn his latest batch of cadets into the Emperor's Finest. Or, at worst, at least make them competent. He smiled and shook his head at the memory of his father, then grabbed a hat from his desk. Heaving himself out of the chair and straightening his uniform, he put on his favourite scowl and marched towards the door.